April 7, 2019: The AMC TC Episode 3! And here's finally the promised review of the third AMC TC episode. A bit of a status update is in order. The third episode of the epic AMC TC was released some days ago. It's available here. I'm working on finishing both that and the Alien Armageddon update mentioned a few updates ago, so reviews are on the way, but these releases aren't exactly something you can finish in an afternoon. But I did manage to play through an obscure old shooter called Requiem: Avenging Angel about a month ago, so here's a review that's been lying on my hard-drive for a while now. March 3, 2019: Poison Heart! And here's finally the promised review of Poison Heart, MRCK's latest (and best!) map. February 28, 2019: Ballz of Silver! Sanek has released a spiritual sequel to his Candy Mania called SilverballZ. Check out the review here. MRCK also released a new map, but I got stuck early on when I gave it a shot earlier today and then other things got in the way, so a review will have to wait for the next update. For now, download the map here. February 18, 2019: Duke Abducted! Well it took another month for another worthy map to appear, but here's High Treason's Alien Abductee. Alien Armageddon also got a major update a few days ago, so expect a review soon(ish)! January 17, 2019: A Legend Returns! What a great way to kick off 2019; the legendary C3PO has returned with a brand new map. Check out Shocking Twist. Also replayed Sin for the first time in about a decade and didn't enjoy it - at all. December 31, 2018: Toward 2019! 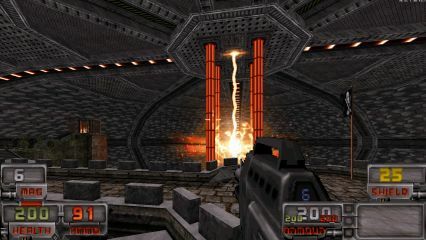 This year also saw the first release of Ion Maiden. Its full version is on its way; probably many are eager to try out its map editor, including many with no previous experience of Mapster32. We'll see what kind of effects this ends up having on the Duke3D mapping community in 2019. A couple of new releases to wrap up the year: check out 2018 Final Beer Run and XMAS 1997. December 24, 2018: The Randomaniac! 2018 is about to draw to a close; you've still got one week left to put out any Duke3D related projects if you wish to make this year's statistics look a bit better. Anyway, it's Christmas today (36 minutes past it actually), and, as usual, what a better way to celebrate it than by playing Duke3D. Mr the Killer was released earlier this year but it got updated with a brand new episode, The Randomaniac, a few weeks ago. So check out MSDN's updated review of the Total Conversion here and download & play it for some holiday fun. Merry Christmas and enjoy the rest of the year! December 12, 2018: Miner Complications and Dark Temple! We haven't seen StarCraftZerg in a while, but now he's back with an action-packed map taking place in a mining facility. Check out Miner Complications, a map worthy of 93 points. Also, check out Zaxtor's (don't forget Trequonia) Dark Temple if you've got the Nvidia hardware required to run this Polymer-powered, multi-layered map. I don't, so I'm gonna have to wait for the day when Polymer lets me have more than 2 frames per second. A few game reviews today: Hexen 2 (another game that took me 20 years to get around to) and Wolfenstein 2: The New Colossus (guest reviewed by Gambini the Puny). November 16, 2018: Finally Trequonia! Zaxtor's Trequonia was released over a year ago, but with its 20-hour length and high difficulty level I just couldn't push myself to play it without taking a few long breaks. Anyway, now it's been reviewed. October 31, 2018: Block Mind on Halloween! Another fright night, another Duke3D map. Here's Block Mind from DannyFromNewOrleans. October 23, 2018: Redneck Rampage! After about 20 years I finally got around to playing the entire Redneck Rampage collection, so check out the review here. October 13, 2018: Duke Express! Here's, as far as I know at least, the first Duke3D map based on Futurama. Check out Duke Express for a chance to explore the Planet Express spaceship from the animated series. This one appeared on Steam Workshop some months ago and I finally got around to taking a look. Devil's Gate is JMW's third map; check his other two here and here. September 16, 2018: Game review time! 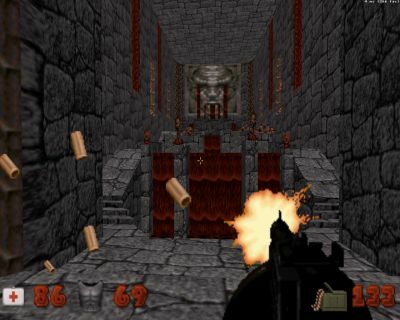 Not much news from the Duke front, but I had some time to finally try out Chasm the Rift, a kinda Quake-like shooter from 1997, so check out the review here. I've been thinking of going back to some of these old classics (and "classics") lately, so Chasm might be the first of many. August 29, 2018: Alien Armageddon! Well, the summer is almost gone and what better way to wrap it up than by playing an awesome Duke3D mod. Check out Alien Armageddon for a chance to play either as or with none other than Bombshell! July 26, 2018: The Tower! Well, three weeks of summer holiday are over (and I didn't get to enjoy much of that anyway due to an unfortunate event) but it's still hot as hell in Finland; I cannot wait for the temperature to drop 50 degrees so that I can actually feel like doing something. In any case, about exactly a month after Detain was released here, it gets a sequel. The map is called The Tower and it's centered around a boss fight. One more week until the start of the summer holiday, so here's Detain to pass the time. A month ago I promised I'd deliver an update once per week for at least a month and I've managed to do just that. Of course it's all thanks to the fact that people have been releasing new maps for this game. Last week I reviewed a map by DannyFromNewOrleans. The map left me mostly disappointed, but now the author has released a new map that's a noticeably improvement. So, check out Magdalene! June 3, 2018: Day of Night! Here's a map that just barely made it to the Hot Maps section; Day of Light has some nice design but suffers from a plethora of issues. May 27, 2018: Mr The Killer! Another weekend, another review. Here's Mr The Killer, an all-around fun 6-map mod by Seb Luca. May 20, 2018: Dark Seed! Thought I wouldn't make it with this week's promised update? 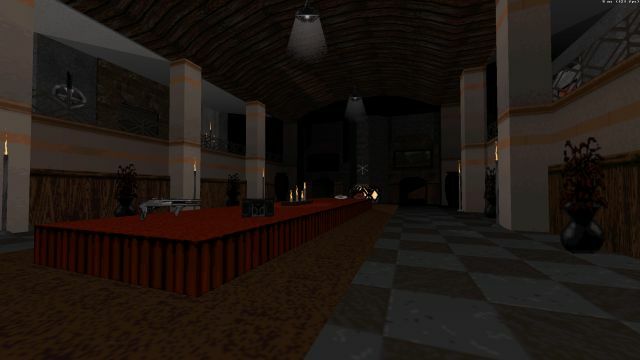 Well, check out Sanek's Dark Seed for a more atmosphere/story-driven Duke3D map experience. Okay, it's been nearly two months since the last update; not only that, but I missed the anniversary update. This time it wasn't due to any lack of releases either. I do have a new job, but that's not a good excuse either; I haven't had any problems finding the time to play a whole bunch of games recently (and catch up with recent events in Spawn, which I hadn't read in eight years or so). But at least I finally managed to finish pretty much every unfinished game I had on my Steam library. So now it's time to buckle up and start updating. I'll set it as my goal to update once a week for the duration of at least the next 30 days or so. We'll start with Mister Sinister's new map, HEALTH. March 25, 2018: Duke + Metroidvania = Duketroid! Here's something a little bit different: Duketroid is an interesting experimental Duke3D map built around the "Metroidvania" concept. March 18, 2018: Total Meltdown! About two months ago I was concerned about the lack of releases last year, but now that we're two months into the new year we've already gotten at least two significant releases. 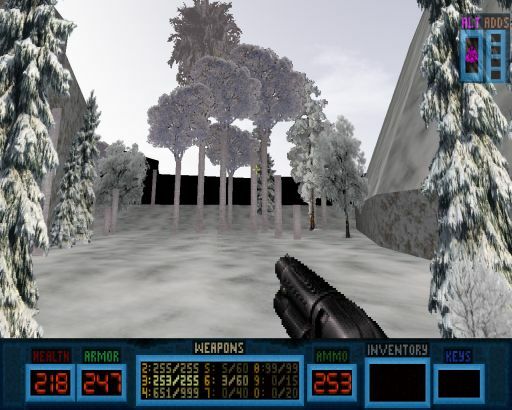 Ion Maiden was already mentioned in the previous update and now it's time for Total Meltdown, an EDuke32 recreation of the 1997 PSX Duke3D port. Check out the review & download here. March 4, 2018: Ion Maiden! Duke Nukem's forgotten female sidekick "Bombshell" finally has her own first-person shooter; check out Ion Maiden's "preview campaign", an Early Access release of the upcoming Ion Maiden. January 29, 2018: Met-Art Miracle! Like always, MSDN missed a few new releases, but even so it's clear that 2017 was an abysmal year. We did see some long-term projects being finally released, including Trequonia (I still have to finish it; I'm about halfway through), but that doesn't really change the overall picture for the better. Granted, the amount of mappers has been small for well over a decade now so that the annual totals are heavily influenced by random fluctuations (even if we can still discern a downward trend simply by looking at the list). This could mean that many projects missed the 2017 release date just barely and are on the way in 2018. In the best-case scenario we should see a new AMCTC episode as well as a considerable update to our glorious DNF2013 at some point this year. Anyway, to kick off 2018 here's Met-Art Miracle, a worthy map even if it didn't quite make it to Hot Maps. December 29, 2017: Between Christmas and New Year! Sorry for the lack of a proper Christmas update but I was out of town and just couldn't find the opportunity to both play the game and update the site. But anyway, the 20-Sector Community Build Project has finally, after seven years, been released. Sanek also released a Christmas map for his Candy Mania mod; I added a small mention (it's a short map) on the mod's review page. Finally, after many years I managed to play Anachronox for the first time and just had to write a review of the game. Haunted Nukem Episode 2 has finally been reviewed! November 17, 2017: Candy Mania! Sanek's put out something a little bit different this time (well, this isn't the only time he has come up with experimental stuff). Check out Candy Mania for some rainbow colors and gameplay! October 31, 2017: Ghoulish Nukem! Have a very ghoulish Halloween! September 27, 2017: Naked Dash! Mister Sinister has come up with another cool, innovative map. Check out Naked Dash if you believe you've got what it takes to survive a maze filled with various Build tricks. September 10, 2017: Back to Hollywood Holocaust! Hollywood Holocaust has been "rethinked" in Polymer; check out the review here. August 22, 2017: Trequonia is out! Zaxtor's (the author of Oblivion) Trequonia Total Conversion is finally out. The TC has nearly 20 new maps, and if Oblivion is anything to go by, finishing this thing is going to take quite a while, so a review will follow later. For now, you can download the mod here (warning: the filesize is pretty massive at 2.7GB!). Leave comments here. July 15, 2017: Spacetronic & new Duke3D website! Maarten van Oostrum released a space epic earlier today. It's called Spacetronic and it scored 97 points so check it out! Paul Bolduc, the author of several True-Room-Over-Room-heavy maps, recently started a new Duke3D mapping related website, http://www.dukemaps.net. MSDN welcomes this addition to our shrinking family of exclusively Duke3D-focused websites, so check out the site now. Also, Duke4.net recently conducted a chat with Randy Pitchford, the CEO of Gearbox. The chat touches on some Duke3D related topics as well so check it out here. July 2, 2017: Hostile Terrain! It's been a quiet year so far as far as Duke3D mapping is concerned, but here's finally something new: Hostile Terrain is a new Hot Map from Peter Williams, whose Duke3D mapping career spans nearly two decades now. Also check out my review of Deus Ex: Mankind Divided. 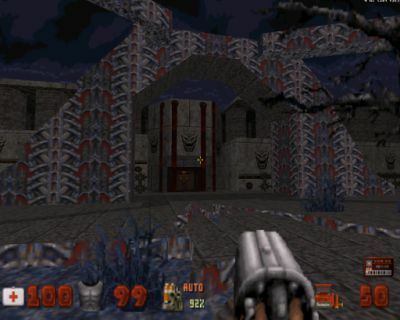 It's time to resurrect the lesser-known Maps section with Gotcha!, a remake of a Doom 2 map. The author is Jolteon 3D, who has released some worthy maps recently that I'll try to have reviewed here sooner rather than later. As of today, MSDN is 18 years old. This time I don't have any brand new releases for you, merely updates to previous releases. First of all, Duke Forces has been updated with a new episode (along with a bunch of new features). In addition, Zykov Eddy's The Dream 2 has gotten a Polymer-powered update, and Loke finally put some enemies in his movie-based map The Thing. I also recently finished Chaser, a first-person shooter from 2003, which has been reviewed here. Enjoy! April 15, 2017: Adg 06! Several authors from the past seem to have resurfaced recently. The latest of these is Alejandro Glavic, the legendary webmaster of the AMC. It had been over ten year since he had released something for Duke3D, but a few days ago he put out a new map, Adg 06, a city map that takes place in Buenos Aires. Check the review & download here.